The rich guys from ElectronicBreaks are back again with another drop test and this time with the latest Samsung Galaxy SIII competing with the iPhone 4S. Previously, I posted the video of the iPhone 4S and Samsung Galaxy SII Drop Test where the iPhone 4S took a good beating ! Shattered screens mostly whereas the Galaxy SII passed three of the tests without a single scratch! Well, there was some but those could be ignored. What’s the use of watching these videos ? Oh come on, imagine a scenario where you drop one of these babies and when you pick it up, you see shattered glasses on the floor with multiple cracks and worst, the phone dead. All the money, goes down the drains. 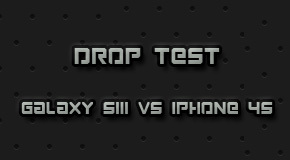 Here’s the previous video of the drop test of iPhone 4s and the Samsung Galaxy SII in case you did not watch it. Do watch it carefully so that you can compare it with the latest videos. The iPhone had a shattering experience from all the tests that were carried out but the mighty SII left the testers surprised and amazed to see that it had survived three of the tests. I expected the screen to at least crack with the face down drop but the Gorilla Glass showed its mightiness. However, the much acclaimed Galaxy SIII powered with Gorilla Glass 2 would of course make us believe that it would be much more stronger than its previous version. Indestructible. Right ? No. The guys from ElectronicBreaks took a new approach this time. The first test, a drop from the ear, the second one, what would happen if your kids throw your phone up in the air ? and the last one showing the drop from a car accelerating away. Right at the first drop, the Galaxy SIII suffers a crack at the bottom screen but surprisingly nothing happens when the kids drop it from a great height. However in the third test, the SIII looks to be completely destroyed. Actually only a fool would keep his phone on the trunk cover but yes mistakes do happen. Here’s another video of a drop test of the same phones from the Android Community. The SIII faces the same fate as shown in the previous video. Too bad at the last part, the Galaxy SIII’s touch screen is completely broken and it doesn’t seem to work any more. Now if you want to base your decision on drop tests then without any doubt the Galaxy SII is the perfect choice but in terms of hardware specs and latest features, the Galaxy SIII is the phone that you MUST go for. Have fun watching the videos ! Thanks for such a wonderful & brief article with covering all the very strong & considerable point comparison between Samsung Galaxy S3 & iPhone 4S. It helped me a lot in improving my knowledge about comparison between Samsung Galaxy S3 & iPhone 4S. Well, that does seem like it from the videos but according to the videos, its not as durable as SII was. I’ll be searching for your required info and will let you know ! Thanks for commenting Chris !